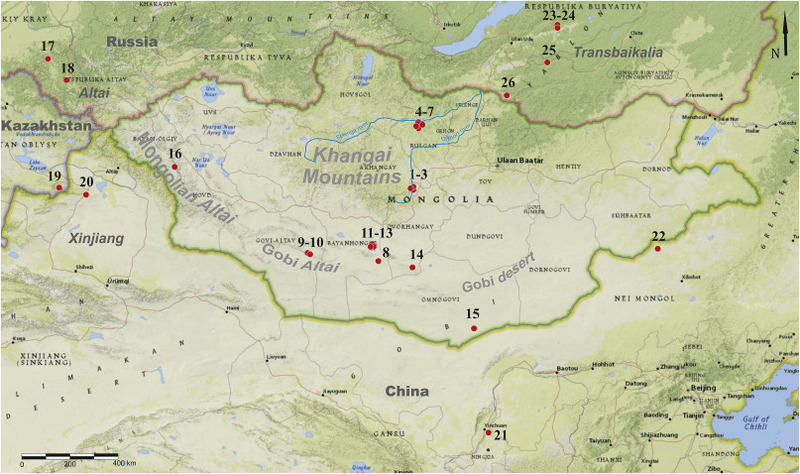 Situated on the eastern periphery of Central Asia, Mongolia was a potentially important pathway for the migration of palaeopopulations from the west to the east (and/or vice versa). Possible scenarios for the dispersal of ancient human populations in Mongolia are much more complicated than we initially supposed, due to the limited number of corridors penetrating natural barriers like the mountains of southern Siberia in the north and the arid mountain systems of the Mongolian and Gobi Altai ranges in the south. Nevertheless, we can detect several episodes during which those barriers were crossed by human migrants in the Upper Pleistocene based upon the geographic distribution of various species of Homo. These migration events can be detected by analyzing variability in lithic knapping technology and stone tool assemblages in Mongolia. The earliest two dispersal events we can identify - the Terminal Middle Paleolithic (TMP) and Initial Upper Paleolithic (IUP) are associated with an extremely complex and enigmatic question: who were the bearers of those cultural traits and did they successively replace one another, or did they co-exist, overlapping culturally? Both the TMP and IUP are associated with the Levallois reduction technology. Here, we attempt to analyze and interpret the entire spectrum of Levallois methods from chronological and technological perspectives, identified in Terminal Middle Paleolithic and Initial Upper Paleolithic assemblages from Mongolia. We identify four principal Levallois methods. The reduction strategies associated with them share features in common with lithic industries from the Russian Altai district in southern Siberia as well as northwestern and north-central China.